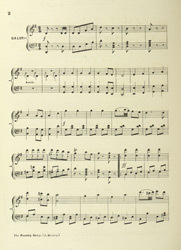 Music sheets from the Victorian period contain references to virtually every aspect of Victorian life including fashion, royalty, politics, the military and especially work. The workplace often featured in songs but there were distinct regional differences. Songs were often based on idealised variations, for example an industrial area like Birmingham appears in this song while farmers and labourers appeared in songs about the West Country. The Gallop was the simplest dance, all couples were expected to do was dash across the room with only the occasional dance step along the way.